Many of our customers call us just for red wine spilt on carpet. Let us save you some money and tell you our secret! 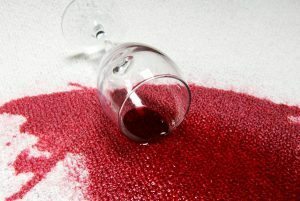 If a red wine stain occurs on your carpet the trick is to act FAST! Step 2: Blot the affected area with the white towel, absorbing the peroxide and red wine. Step 3: Use the shop vac to extract the peroxide/wine solution from the rug. Step 4: Repeat Steps 1, 2, and 3 until you no longer see red. Step 6: Use the shop Vac to Vacuum the water from the rug.